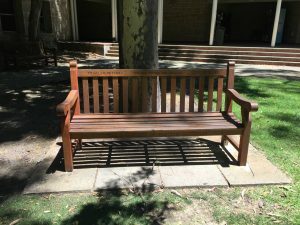 The VIDA blog Inspirational Women series continues with a celebration of the life and scholarship of Australian early modern scholar Patricia Crawford. Patricia Crawford – Trish – in 2007. Image provided. Patricia Crawford – Trish – was born Patricia Marcia Clarke on January 31, 1941. 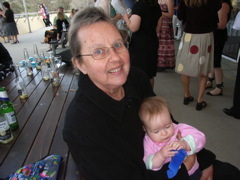 After graduating from The University of Melbourne with a Bachelor of Arts (Hons) in 1961 and marrying Ian Crawford, the anthropologist with whom she would later co-author Contested Country: A History of the Northcliffe Area, Western Australia (2003), she moved to Perth in 1962 and enrolled in postgraduate studies at The University of Western Australia (UWA). Trish began teaching early modern history at UWA in the early 1970s, and was offered a permanent position in 1976 following a change in the university’s policy concerning the employment of married women. She was promoted to the rank of professor (the History department’s first female professor) in 1995, and remained at UWA until her death, aged 68, on April 28, 2009. As a gender historian and an early modernist, Patricia Crawford has formed part of the backdrop to a generation of undergraduates’ learning, pioneering aspects of debate about women’s past lives, and acting as a great supporter and mentor of female colleagues globally. An enduring legacy Trish has left the fields of early modern social history, women’s and gender history is the attention she has drawn to the need for different perspectives and different methodologies when studying subordinate groups whose lives have left fewer traces in the historical record. Crawford is widely recognised as a pioneering scholar in the field of women’s history. 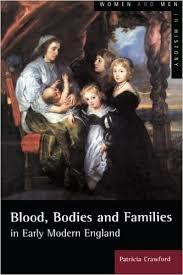 Her Past and Present article, ‘Attitudes to Menstruation in Seventeenth-Century England’ (1981), spoke directly to the need for new historical enquiries into women’s experiences identified by Anne Gordon, Mari Jo Buhle and Nancy Shrom Dye when their essay ‘The Problem of Women’s History‘ (1976) argued that ‘the writing of women into history necessarily involves re-defining and enlarging traditional notions of historical significance to encompass personal, subjective experience as well as public and political activities’. At the time, bodily processes – especially menstruation – were not only dismissed as historically unimportant or ahistorical, they were still considered taboo. Examining attitudes to such taboo issues was important, Crawford argued, to understand the direct influence they had on wider ideas about female inferiority and about the social (and ultimately domestic and reproductive) roles assigned to women in society as a result. 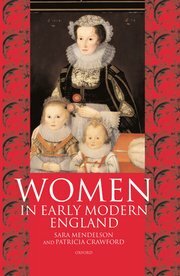 This article is still included on undergraduate reading lists (UWA’s HIST2013: Medieval and Early Modern Women, for instance) as an example of the momentous historiographical shift that women’s history demanded in its call to widen the lens of what is deemed historically significant (or even just ‘to have a history’). ‘Attitudes to Menstruation’ highlighted the need to attend to the experiences of all women – not just the elite, or the literate, or the extraordinary. If we were to base our understanding of history only on the evidence we glean from those with the time, means and privilege to leave behind sources, Crawford believed, we would have a very skewed and unrepresentative perception of history: one that blatantly privileged elite, white, men. A focus on ordinary people’s attitudes, experiences and voices became a hallmark of her research, as did the methodology of ‘reading against the grain’ to consider issues from different perspectives. Crawford thought about the (often profound) importance of historical silences and omissions as well as historical action. 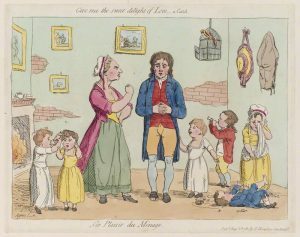 James Gillray, ‘Les plaisir du mènage’, published by Hannah Humphrey, 1781. Hand-coloured etching, 223 mm x 281 mm, NPG D12294. © National Portrait Gallery, London. 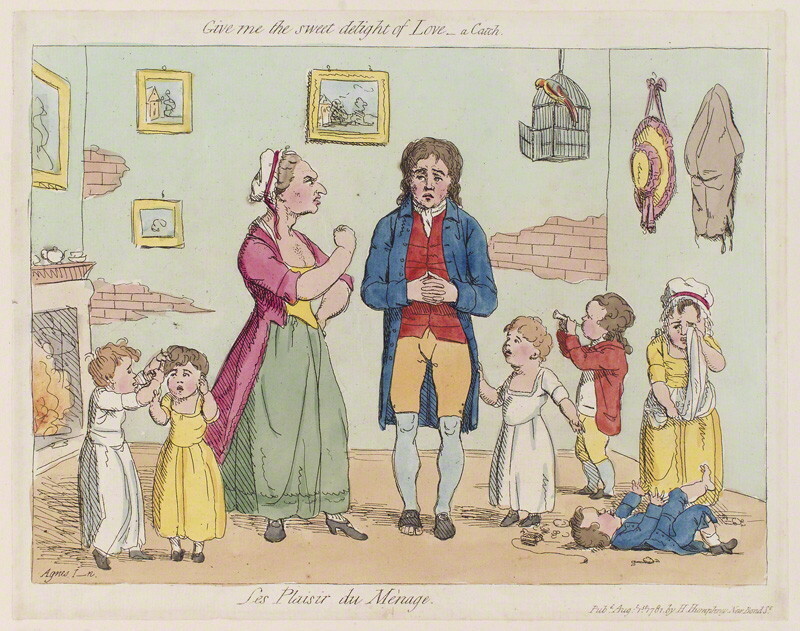 This image appears on the cover of Parents of Poor Children in England, 1580–1800 (2010). The different perspectives she sought to examine and elucidate extended to women’s engagement with religion in Women and Religion in England, 1500–1720 (1993), to the experiences of different groups of women in Women in Early Modern England (1998), and to the experiences, expectations and challenges of parenting amongst the poor in Parents of Poor Children in England. Crawford approached each of these endeavours with enthusiasm and compassion – something reviews of these books regularly draw attention to – and also with a gritty determination to ‘set the record straight’. From challenging historiographical assumptions about women’s passive detachment from religious debate to debunking arguments that poor parents didn’t feel the same love and devotion for their children that the wealthy did, Crawford was adamant that we should ask questions about how we know what we know, and what we might be missing. Ultimately, she argued, it is crucial to understand the reasons that informed particular patterns, actions and assumptions in order to comprehend the nature and limits of people’s decisions, engagements and relationships. Just because a desperate and materially devastated single woman handed a baby over to the London Foundling Hospital, for example, did not mean she felt no affection for it. In order to understand her actions we need to recognise her status and her situation, for ‘[p]overty, rather than lack of feeling, determined much of the behavior of mothers and fathers’. Crawford’s engagement with the aims and objectives of second wave feminism led her to publish, with Myrna Tonkinson, The Missing Chapters: Women Staff at The University of Western Australia, 1963–1987 (1988). She was deeply committed to overcoming sexism and oppression, and in this volume the authors shone a light on the situation of female academics and the challenges they faced. Trish also made a conscious effort to form the kinds of networks and bonds that would foster support for women and counter exclusionary practices. Many of her publications were collaborative ventures. 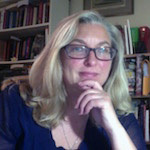 For example, she wrote Women in Early Modern England and ‘Sexual Identities in Early Modern England: The Marriage of Two Women in 1680’ (1995) with Sara Mendelson. Crawford collated and annotated Women’s Worlds in Seventeenth-Century England (1999) with Laura Gowing, and edited Women and Citizenship: Suffrage Centenary (2000) with Judy Skene. This dedication to collaboration, Sara Mendelson explained in an obituary notice published in History Workshop Journal in 2011, ‘was partly a result of her conviction that co-operative rather than competitive ventures embodied the true spirit of feminism’. 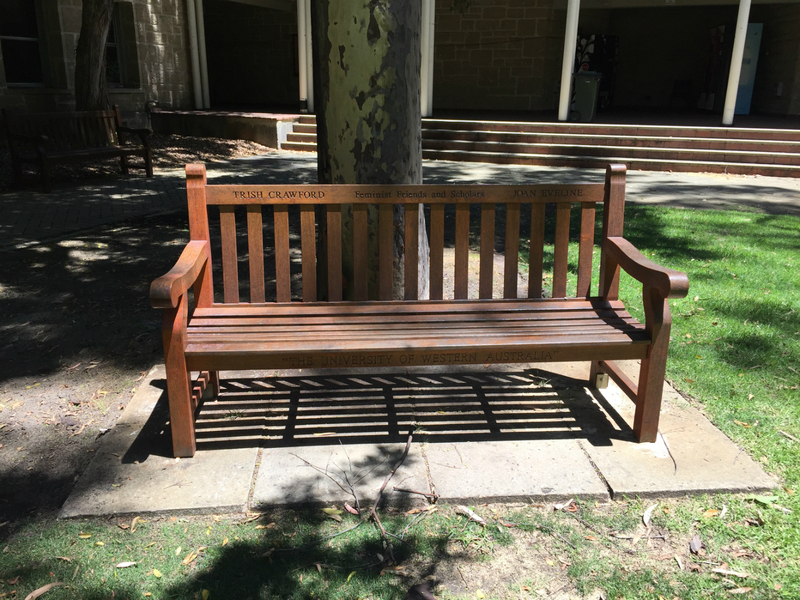 The memorial bench dedicated to Trish and her good friend Joan Eveline, in the Patricia Crawford Courtyard at The University of Western Australia. Trish became a mentor for generations of female scholars, whether they recognized the importance of this at the time or not. Not only did her mentorship have an impact, but also her unwavering belief in the need for this kind of support. It is when we still encounter sexism in our daily routines, or hear horror stories from colleagues about the discrimination they have faced, or sit through conference papers that fail to take any notice of marginal voices, that we realise how much the collective postdoctoral sigh was taken for granted when Trish asked seminar presenter after seminar presenter about the importance of gender. Patricia Crawford’s research was driven by passion: by her desire to give voice to the voiceless; by the value she invested in families, communities and friendships; by her rejection of prejudice; by her love of particular places. In her work, as in her life, Trish firmly believed that biology was not destiny, that recognising agency empowered those so recognised, that emotions were profoundly important and that gender always mattered. Regardless of whether passion was a quality that drew certain people to her in the first place or was something she fostered, the conviction that it should guide, shape and propel historical enquiry has left a lasting impression for many of us. 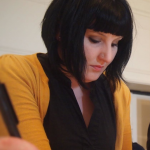 Joanne McEwan is a Research Assistant and Short-Term Fellow with the Australian Research Council Centre of Excellence for the History of Emotions (Europe, 1100–1800), based at The University of Western Australia. 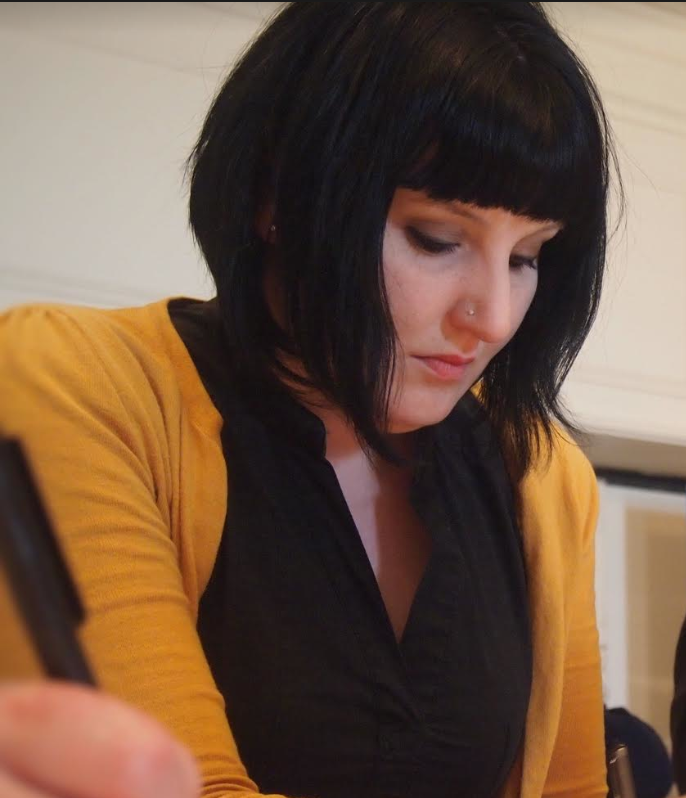 Her research focuses on gender, crime, families, households and emotional attachments in Britain from the seventeenth to the nineteenth century. Joanne has previously published on lodging arrangements in early modern London, attitudes towards domestic violence and infanticide in early eighteenth-century Scotland. Together with Pamela Sharpe, Joanne is the editor of Accommodating Poverty: The Housing and Living Arrangements of the English Poor, c.1650–1850 (Palgrave Macmillan, 2010) and, with Philippa Maddern and Anne Scott, Performing Emotions in Early Europe (Brepols, forthcoming). Patricia Crawford was one of her doctoral supervisors. Follow Joanne on Twitter @Jo_McEwan_. Stephanie Tarbin is a Research Assistant with the Australian Research Council Centre of Excellence for the History of Emotions (Europe, 1100–1800), and a Lecturer in History at The University of Western Australia. Her main research interest is the gender and social history of late-medieval and early modern England and her doctoral thesis examined moral regulation in London, c. 1380–1530. She has published essays on moral regulation, masculinity, women’s friendships and children’s experiences. With Susan Broomhall, she is co-editor of Women, Identities and Communities in Early Modern Europe (Ashgate, 2008). This collection is a festschrift for Patricia Crawford. This entry was posted in Inspirational women. Bookmark the permalink.